We entered Poland through the backdoor—on a minor secondary road in the Tatra Mountain woodlands and enjoyed the carefree riding afforded by a lightly used road. Then it started happening, as soon as we turned onto a normal-use secondary road we got nipped by drivers—drivers that were cutting too close after passing us. There were 2 instances on the first afternoon, both in situations in which there was no excuse for cutting us so close. But it wasn’t until the next morning after it happened a couple more times that last year’s similar experiences with Polish drivers came flooding back. After being back in Poland less than 24 hours I again have to say that their country has a record-breaking number of drivers who handle their cars like bratty 16 year-olds. One couple even flipped us the bird out both sides of their car after cutting us off—a synchronized maneuver that looked well practiced. There are a few bad drivers everywhere and we all occasionally make mistakes or bad decisions when driving but the Poles rank high on a short list of rude, thoughtless drivers. In one day we can accumulate the number of close-calls we usually count in a month in most any other country. The drivers on the Amalfi Coast of Italy are the only other motorists that have so consistently cut-us off but unlike the Poles they had the incredibly narrow, windy, and heavily traveled road as an excuse. It is only in Paris and Poland that we find so many drivers that are just plain mean or inconsiderate when behind the wheel. In addition to being greeted again by rude drivers on our second visit to Poland we are encountering equally bumpy roads here in the southern lands as we experienced in the northern reaches of the country last fall. The extensive patching makes the roads look like decks of giant playing cards have been dumped onto the asphalt with many of the cards overlapping. Some stretches display more surface area in the form of patches than in original tarmac and have the jostling feeling of cobblestones without the sharp edges. Thank goodness for our suspension stems that Bill bought after the severe jarring in Poland and Turkey last year. These stems relieve a lot of upper body and head pounding and now Bill is pondering suspension seat posts set to relieve a little of the jarring on our rear ends (though we are told they dissipate too much of one’s pedaling power). But in fairness to the Polish roads I’d add that another cyclotourist we met has the opposite opinion of the road surfaces here—he loves them. He even found that his daily mileage went up in Poland because of the glassy-smooth asphalt. But his travels are being guided by a much larger scale map than ours, a map that only shows the connections between the large through roads—the roads that Map Man scrupulously avoids. Bill has worked hard at reading between the missing lines on our smaller scaled maps to keep us on the relatively quieter roads that unfortunately are much rougher going. This different opinion of Polish roads came at the end of an unusually chatty interval in our travels. The interval began with the 2 days spent in Slovakia visiting with our English speaking Polish friends Kuba and Kasia. The next day, our last in Slovakia, I had a long chat with a 30-something Polish woman who couldn’t hear enough about our travels and reminisced about her 1 bike trip to Stockholm as a college student. We hadn’t even made it out of town (Zakopane) and we found ourselves chatting with a Dutch couple on a tandem that had also traveled in the US. And not much past the city limits Michael (the large-scale map man) stopped to confer with us about the road he was on that wasn’t on his map. He is a US ex-patriot who divides his time between living in China and France. Michael has been bike touring for at least 25 years, including in Asia and South America. We swapped web site addresses, maintenance theories, gear tips, and best/worst places to go. We’ve started collecting tips about how to get a difficult-to-obtain Russian visa as we still hope to visit St Petersburg (though perhaps without our bikes) and Michael had some great suggestions. All of this happened after commenting to Bill the day before that it was a shame that peak touring season was about over and we still hadn’t talked to any serious cyclotourists on the road! While in the Tatra Mountains I kept wondering why the Poles flocked there by the thousands. The mountains are pretty but many of the Poles endured a 3 hour wait at the border crossing into Slovakia (like Kuba and Kasia did) after hours of driving. Once they arrived in the tourist area there were hoards of other people on the paved walking trails and queuing up for scarce lift tickets to the best views--only the backpacker’s have much hope of solitude. But on our second full day in Poland I understood—they go to the Tatras to breath. It wasn’t long after we left the last touristy Tatra foothills town of Rabka that we got clobbered by the pollution of the heavy industry in Poland’s southern region. Our eyes and noses were running, my lungs protested mightily on the climbs and our sensibility was offended at the panoramas obscured by the smog. I too would head to the hills to hang out for the breathable air alone. But since we were heading into the muck instead of away from it, I found myself praying for an air-cleansing rain. Poland’s pollution comes from many industrial sources but one of the most absurd is a steel plant at Nowa Huta in Krakow’s suburbs. It was built after WWII by the communists to counter the more intellectual traditions of Krakow with some good working-class influences. The drive to dilute the intellectuals was undeterred by the absence of any of the needed raw materials in the area. The Krakow area is now burdened by the tremendous environmental damage done by the plant (including to their historic buildings), a money-losing behemoth and the loss of prime agricultural land. We passed on our guide book’s suggestion to spend a few hours wandering around the ugly town. The great salt chapel with 'tile' floors & crystal chandeliers. Wieliczka is about 6 miles south of Krakow and we called it home for 4 nights rather than chance looking for lodging in Krakow on a peak season, August weekend. The price was right and the walk and then ride on the local minibus into town was under 30 minutes. Though we missed the immediacy of staying in the old town, having BBC TV news and a telephone internet connection let us do some welcome catching up on the news, both international and with our friends. Wieliczka is an UNESCO World Heritage Site that Michael the ex-pat described has having been too “UNESCO-ized”. They have made these 700 year old salt mines a little too cute and have diminished the historical experience in the process. We lingered after the 2 hour tour of 1% of the extensive network of chambers to visit the underground museum. As we expected, the museum had more historical goodies in it for us but we were whisked along at the tour guide’s hurried pace and not allowed to satisfy our curiosity by pondering the old wooden gears, other equipment and photos. We were disappointed with the brief tour of the museum, but it is pretty typical in Eastern Central Europe to have to visit museums be only with a group and quick. 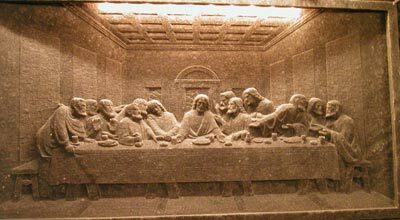 The Last Supper bas relief carved in the salt wall. 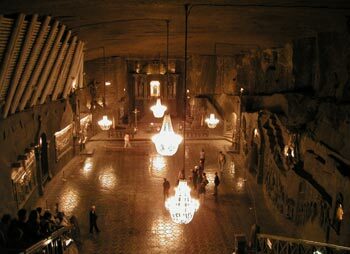 The Wieliczka mines are distinctive for the carvings miners have sculpted in the salt caverns. This salt isn't white but a dark gray-green from its 5% contamination with clay and sand. Most of the artwork has a religious theme. There are numerous small chapels and statutes but the crowning piece is an enormous ballroom-like space in which almost all the surfaces are salt. The buffed-to-a-shine-with-use floor looks like it is made from hexagonal floor tiles with recessed grout, the metal-framed chandeliers are loaded with salt rather than glass crystals, and the hall is decorated with religious statuary and bas relief type ‘paintings.’ It is impressive to see and my mind runs wild with the thought of having a nearly self-healing flooring: “redoing” salt floors would mean filling in the nicks and cracks with a strong brine solution, blasting it with a hair dryer and then buffing it back to a sheen with normal traffic--cheap and easy! (Yes, Bill is nervously wondering if I’ll really pursue it). Krakow is an easy old town to visit as it is all contained within the now-filled in old moat. Its compactness led our guide book series, the one that listed 12 walking tours for seeing Budapest, not to give a single walking tour of Krakow. Rather than taking a walking tour they instead recommended keeping your eyes open while visiting museums and other points of interest. Note the arm brandishing the sword behind the eagle. In Krakow as in much of Eastern Central Europe the “best of” is “the best in town” or the “best in Poland” rather than “the best in Europe” or “the best in the world.” The historic castle and castle cathedral, the old fortifications and the museums felt unremarkable compared to others we have seen. 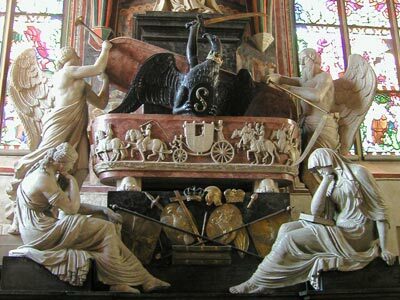 But I must say the sculpture Bill captured in a photo with an eagle and a sword brandishing arm rising up out of a sarcophagus was a startling sight in the Wawel castle church. One of the highlights for us in Krakow was St Mary’s gothic church in which every interior surface is painted and decorated (unfortunately no photos were allowed or we’d show you). We still remember being stunned at learning in Cologne, Germany that gothic cathedrals weren’t originally gray and dull inside like most are today but highly decorated, perhaps in keeping with their colorful stained glass windows. At St Mary’s church we didn’t have to use our imaginations to know what it originally felt like as it was dramatically and decoratively painted. Many of the wall and ceiling surfaces weren’t covered with religious scenes but instead decorated with bright geometric patterns. Like many of these old churches, the paintings, sculptures, and alters aren’t necessarily tastefully coordinated but they were certainly rich in design. Krakow's 14th century Florian Gate. Our “ah-ha” in Krakow was learning the source of some of our confusion about which museum pieces are Turkish and which aren’t. Early in our travels we thought any old, highly ornate guns and swords were Turkish, captured during the Ottoman invasions of Central Europe. But this summer, with better labeled exhibits, it became clear that ornate Central European and Turkish weapons were indistinguishable to us. A Krakow museum guide shed some light on the similarities by explaining that the Poles had a longer history of contact with the more eastern lands and that their arts had been more “orientalized” than those of Western Europe, presumably leading to the similar look on the weapons. This orientalizing (which is often referring to influences from Near East countries like Turkey and not the Far East) was especially evident in some early 1700’s Meissen porcelain figurines. The Polish noble figures were dressed in billowy print pants; long flowing unstructured coats; broad colorful sashes; and turban-like hats. Their look was completed by great moustaches and broad, curving swords at their sides. This eastern fashion craze of Polish nobles was so novel that these figurines became wildly popular in Western Europe, far beyond their intended distribution. But while taking in the sights in Krakow we were sorry to see that our bratty, 16-year-old driver stereotype of Poles was expanding to our experience of some of the people out of their cars too. The haughty, pushy behavior in queues seems just like the arrogant drivers that cut us off when on our bikes. Of course, it’s not every one, but it is a significant enough number of people that we notice. We haven’t a clue if it is a manifestation of an old cultural pattern or a “nouveau riche” mentality that has captivated the people in their 20’s and 30’s. What ever the source it sure is ugly and makes us anxious to leave Poland for less jostling both on and off our bikes. A series of minor experiences on our ride out of Krakow felt unusually foreboding. On that day we had finally started heading west in earnest and were met by strong headwinds. I shuddered at the thought of those prevailing headwinds challenging us for the months ahead as we set our sights on Spain. The strong winds will make riding more of a struggle and it will take a bit more resolve to stay with it—to accept the harder work and slower progress made each day. And that day we were riding towards a threatening dark cloud mass ahead. Our westward course would eventually turn a bit north to Dresden, which we just missed seeing last year because of the record-breaking floods. I hoped that those storm clouds would pass and not bring us heavy rains in this region a second year. We had under-read the significance of the storm clouds last year and I wondered how we could better judge them this time around. I had settled in with the thoughts of this fall’s headwinds and last summer’s historic flood when I noticed the train tracks. I remembered that we would roughly be following the train tracks all day. Normally that is a welcome sign as it means the road grades will be moderate and the route easy to follow. But today it sent a chill down my spine as today Auschwitz was our destination. I couldn’t help but think that these same tracks had probably carried thousands of people to their deaths at the concentration camp. The heavy truck traffic on the road to Auschwitz left little time for further reflection about the past and future. By the time we arrived at our destination on the outskirts of town we were glad to finally be off the road. The Polish drivers in this area had been better mannered than those farther east but the rough, narrow road and the fast, heavy traffic had been mentally exhausting. We sought out the Catholic sponsored Centre for Dialogue and Prayer for our lodging because it was walking distance to the “Museum,” as the concentration camp is euphemistically called. But without lifting a finger they hooked us and we stayed an extra day just to take advantage of the extensive video and text library maintained as a part of their mission to encourage dialogue and healing of war related wounds, particularly those of Jews, Poles and Germans. Their resource materials included about 25 videos and a couple of shelves of books in English plus similar materials in a half dozen other languages. Though a part of us wanted to ‘hit the road’ and continue our journey west after visiting the camp, we were glad we stayed the extra day to explore the Centre’s materials—resources that would be hard to come by in the US. One German-made video was of interviews with the adult children of survivors of the Holocaust and juxtaposed those with interviews of the adult children of German perpetrators of the horrors. Interestingly, both groups grew up with myths about their parents. The Germans were handed honorable but false stories about their treacherous fathers only to discover the truth as young adults. The survivor’s kids, all born in Israel, fabricated their own stories about how heroic their fathers had been in the war. Apparently Israelis have only begun to talk about the Holocaust in the last 10-20 years and until then it was a forbidden topic—forbidden because the survivors were viewed as having been shamefully weak, that they didn’t do enough to defend themselves (which is of course absurd). In addition, as a national objective, the Israeli’s wanted their kids to grow up strong and fearless and hearing stories of their parent’s perceived weakness was seen as undermining that goal. Both the Germans and the Israelis interviewed grew up tormented by the conspiracy of silence: both knew from the expressions and behaviors of the adults around them that there were terrible stories to be told about their parents but never heard them and suffered from the deceit. Another video highlighted the Catholic Church ‘coming clean’ about its contribution to the Holocaust and the persecution of Jews. One clergyman suggested that if the Catholic Church hadn’t been promoting hatred of the Jews for the last 1500 years that the Holocaust likely would not have happened. We were curious about the process of changing the Church’s formal position regarding Judaism since WWII, with Vatican II in the early 1960’s being instrumental, and also the importance of the current Polish Pope finally recognizing the State of Israel and making a formal apology in Israel. Readings rounded out our study day with interesting tidbits. The Israeli editors of The Encyclopedia of the Holocaust present the Nazi’s drive for WWII as not being economic, political or military but that of social Darwinism. Hitler had decided that the German people should rule most of the world because of their superiority and that a war would be the best way to prove his point. The liberal French, the Bolshevik’s of Russia and the people of the USA were viewed as being dominated by “the international Jewry” and so would of course have to be taken out and that too would also make a war necessary. That’s a credible argument for Hitler’s motives but not one that I had heard before. A Polish publication with a number of interesting interviews and experiences with young adults told of an ambitious recent study trip for 30 kids with equal numbers from Israel, Poland and Germany. The 2 week trip included historically significant stops in all 3 countries. The Polish youth were horrified to learn that the Israelis held the Poles equally accountable for the Holocaust as the Germans when in reality the Poles were being exterminated in large numbers by both the Nazis and the Soviets. The Israeli’s beliefs were so firm that they feared for their physical safety while in Poland, even as a part of a large group. The shortcomings in the Polish educational system about the Holocaust was also revealed in their study, as their schools emphasized the loss of Polish life in Auschwitz and underplayed the much greater loss of Jewish lives. Not surprisingly to us, in this multi-national group it was the German students that were the best informed about the real story of the Holocaust. We have been repeatedly impressed by the German’s commitment to fully facing their accountability for their nation’s ugly past and in keeping the origins of such brutality out in the open for public discussion. I also admire their individual courage for showing up at places like Auschwitz to learn more at the risk of encountering hatred. The educational experience at the concentration camp itself was a little disappointing. Perhaps it suffers from being run by the Polish government whereas some of the other camps are managed by international foundations. But like the public school education about the Holocaust, the museum seemed to be weighted heavily towards the Poles. 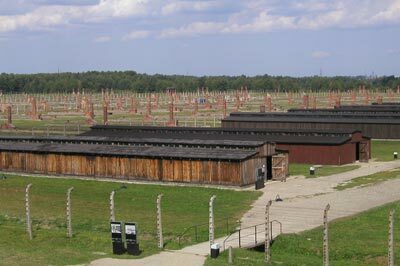 Birkenau (Auschwitz II): field of barrack's chimneys. Many of the displays were only in Polish which certainly diminishes the broader educational agenda of these camp memorials: “Never Again.” And most of the old barracks that were turned into exhibition halls were sponsored by individual countries, presumably ones with citizens sent to Auschwitz. Many of those exhibition halls were bi-lingual: Polish and the language of the host country only. There was no coordination between the efforts of each of the country’s halls so we saw pictures of thousands and thousands of victims but often didn’t get a deeper understanding of the individual country’s story. We thought it a bit odd that Austria was given an exhibition hall but Germany was not. The Austrians welcomed the arrival of the Nazi’s in their country and had longed for unification with Germany, so excluding the German’s on the basis of guilt didn’t make sense. Perhaps Germany declined—we have no way of knowing. But certainly plenty of Germans, Jews and non-Jews, perished at Auschwitz and it seemed unbalanced not to have a space to represent their persecution and losses. The Roma’s were represented in a beautiful, new display as a joint effort between Germany and Poland. I was surprised to see that at least some of the Roma of that era were well integrated into society, living well-appointed middle and upper-middle class lives with their sons even in Hitler’s army until the extermination policies got into full swing and included them. We wished that more of the displays were dated, especially since many of the countries represented had been behind the Iron Curtain. Poland’s section on the brutality of the Soviet’s towards them was clearly done after the break-up of the USSR, as could be seen by the freshness of just those display panels and the harsh tone that certainly wouldn’t have been possible before 1989. But most of the time we were left guessing if the positions represented was “pre” or “post” Soviet rule. But the discrepancies revealed in our camp visit and Centre studies were interesting. The Poland exhibition hall at Auschwitz spoke proudly of the long, shared history of the Jews and Poles in Poland and of the great contributions the Jews had made to their culture over the centuries. However, a Centre video we viewed with interviews of Polish Jews that survived Auschwitz and immigrated to the US told a different story. The prewar discrimination they described wasn’t so surprising to hear, but the violence directed towards them by the Poles when they returned to their towns after liberation from Auschwitz was shocking and certainly conflicted with the rosy picture the Polish exhibit projected. After visiting 4 different concentration camps in 4 different countries we still think the National Holocaust Museum in Washington DC is a better education about the Holocaust than any of the camps. Seeing an historic site like a concentration camp is potent, but the physical experience of a site is only one aspect of a deeper understanding. And most of these camp exhibitions excel at putting thousands of faces on the suffering but don’t go enough deeper. For me, the missed opportunities at the camps include informing the visitor about the general social circumstances and the specific aspects of human nature that allow genocides to keep occurring; and putting what the Nazi’s did in perspective with annihilations by the Greeks, Romans, Venetians, Ottomans and others. But despite the deficiencies of the camp’s exhibits we were pleased to have stayed at the Catholic Centre which allowed our unscheduled Day 2 of our Auschwitz experience to be spent in their library looking for the understanding missing from the museum. I never quite know what to call these former eastern block countries. I always thought of them as Eastern Europe in my overly simplified view: Western Europe was the ‘good guys,’ the countries frequently friendly to the US and Eastern Europe was the ‘bad guys’ and their involuntary satellites on the eastern side of the Iron Curtain. But my expedient model didn’t acknowledge the category of Central Europe, plus the countries just east of the Iron Curtain aren’t really Eastern Europe at all. I guess Eastern Central Europe (ECE) is the proper term for these former Iron Curtin countries we have been visiting but it’s sure a mouthful. The lack of familiar indications of people enjoying their lives in these ECE countries slowly wears us down as travelers. Having felt the resulting heaviness previously when in ECE we expected to feel it again as we entered Hungary in early July. We wondered how 2-3 months in ECE would be for us, as a month had been our previous maximum stay. We prepared ourselves psychologically and stockpiled a few of our harder-to-get inventory items and took the plunge, knowing it would be a little like holding our breath while swimming under water. We also knew from previous experiences that crossing west over that now invisible line back into Central Europe would be exhilarating—there would be a sense of liberation from a very subtle oppression. And subtle it is--this mostly sub-consciously experienced deprivation in ECE. The Tatra recreational area has become a potent benchmark for me and the farther we have traveled away from the tourist villages of the Slovak Tatras the more I understand its appeal to the Poles: it is a rare reservoir of beauty (and fresh air). There isn’t much that is pretty in southern Poland once you leave the mountains, and an oasis like Stary Smokevec where we stayed offers an immersion in the deeply felt peacefulness of beauty. There the scenery is pleasing (as long as your eyes don’t linger too long on the polluted plain below). The stunning mountains, the rejuvenated forests, and the charmingly done tourist villages are all refreshingly beautiful and pleasant. They aren’t plastic and slick but done in a distinctive-to-the-region mountain style with an abundance of rustic woodwork. There are grassy lawns in front of some hotels; smooth-surfaced, leveled paths allow pedestrians walk among the trees and safely out of traffic; and sitting benches and walking trails are readily available. Everything thing that you look at in the area is fresh and well kept and the people are actually smiling--an experience that is hard to come by in parts of Poland and ECE. In contrast, most of the people we see on the streets in Poland aren’t smiling and seem pretty reserved in their interactions with family and friends in public. We are most often received with coolness from the people we ask for directions or people we do business with or are sometimes ignored all together. And I remember saying to myself “That guy must be an American” as he gave us a big, full-arm wave as we passed going in opposite directions on our bikes—no Pole has ever greeted us like that. Usually in ECE it is only the teens and 20-somethings in the big cities that have an ease about them and most everyone else is reserved and on the glum side. 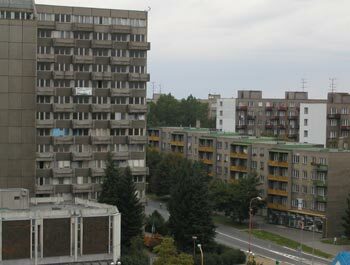 Some of those gray, gray buildings in Eastern Central Europe. Most of our days in ECE are spent being surrounded by dreariness rather than beauty. The endless parade of black streaked gray or brown buildings in the cities and countryside are joyless. Often when we roll into the downtown core of a town or small city the grimacing in my face and shoulders travels all the way down to my gut. How depressing to my eye are these store fronts on the ground level of massive gray buildings with the dirty facades, the rare window displays are usually faded and outdated, and the lights are often partially or completely turned off. My heart sinks at the thought of this being the primary shopping experience of the local residents and I wince again when I realize that I will soon be foraging in that shop or one just like it in the next town. As I look back at our almost 2 months in ECE I realize my memories of pleasing intervals were all in places spiffed-up for tourists. The Lake Balaton area in western Hungary with its cherry B&B’s and proud new thatched roofs; Kosice’s gracious old town and sitting park in Slovakia that compelled us to linger; and the towns we stayed in on both the Slovak and Polish sides of the Tatra’s—these are all popular tourist sites that are primarily catering to the regional tourists. How sad that the people of these countries have to get out of town and head for touristy areas to have pleasant surroundings, to immerse themselves in some beauty and color. One of the things I love about my adopted hometown of Portland, Oregon is that one can hang out in the downtown core or a number of neighborhood districts and be quickly uplifted by the lively energy and a multitude of delights for the eyes. And snow capped mountains, broad rivers, and forests of trees are never far out of sight. Such visual indulgences are hard to come by in many parts of Poland and of ECE. It is clearer to me now that some of the joy in being in the Dolomites, Austria and the river valleys of Germany is that they is so visually pleasant and they feed our souls with their grace and beauty. Our days in those areas are filled to the brim with stunning natural scenery, the sight of lovingly cared for homes and apartments (and bus shelters), window boxes and little gardens heavy with blooming flowers, and robust people who smile in public. Being in those areas is energizing and most every day we revel in the expansiveness of the people and of their land. Even if the people aren’t particularly friendly towards us we can still savor the beauty and liveliness around us. In contrast, in ECE we have to savor the isolated pockets that we come across--places where the mood doesn’t feel so heavy, so solemn, so contracting. But as the weeks pass, our deficit in visual pleasure keeps growing and little bits of beauty aren’t enough to fill the void. This disquiet I feel when there is a sustained shortage of pleasant or nice surroundings seems like a silly thing—something that I should just get over. But Bill and I have been constantly amazed in our travels at the evidence for the strong drive humans have to decorate—to have pretty things around them. Crude pottery that is 6000-8000 years old will have decorative patterns scratched or pressed into them. And at a time when I would have thought food too scarce to sacrifice, people were using berries and other edibles to dye fibers to add color to their clothing. Bill reminded me that first uses of the newly discovered bronze (very roughly about 1500 bce) weren’t tools or weapons but jewelry and other decorative items. Mirrors, beads, earrings, and other body adornments often are among the finds from early cultures. I assume that the people who live in dreary ECE communities have learned to find beauty in their surroundings at home or in a garden or perhaps at church—they must be satisfying their need in a less public way than I am accustomed to doing. Lacking those as reliable sources for pleasant surroundings while traveling in ECE, we have worked harder at bringing cheer into our lodging space if we are staying more than one night in a room. We often will spend more time shopping for a room with a nicer ambiance or more natural light or pay extra for a little larger room to enjoy some spaciousness. And it is in these countries (or in the dreary parts of southern Italy) that we have bought a few stems of gladiolas, displayed our postcards, or draped my scarves to add some color or visual interest to our space. And one fall we bought an inexpensive tape of Vivaldi music to add some liveliness to a Czech room that had a tape player. All of those activities are conscious efforts to inject into our evening’s environment what was missing during the day—something delightful. It is this dreariness that has us both composing a color palette for the next time we nest. We both are intent on having strong colors in our next home—terra cottas, mangos, and peachy yellows. No more earth tones or off-white for us, we want to be immersed in warm colors and lots of them. This infrequency of pleasant surroundings that has clarified our decorating preferences and slowly eroded our deeper sense of satisfaction as we travel in ECE must be minor compared to the profound impact of traveling in countries with rampant poverty. Fortunately, we haven’t yet experienced that. Here in ECE, almost everyone we see is doing OK even though some are still recovering from decades of shortages. Rather than deprivation of shelter, food and clean water we see a shortage of uplifting surroundings. I realize that we have been biking in Europe for about 2 years now. We think of this as our 3rd season as we have flown to Europe 3 times for 8-10 months of biking each time, but when you add up the months we’ve traveled it’s about 24. I still love what we are doing and can’t imagine enjoying anything more than bike traveling overseas. I love being outdoors so much; and I am thrilled by the intense opportunities to be active, to learn, and to be challenged. One of our many hopes for our travels was that it would be a form of therapy—that the sharp disruption of old patterns and routines, the challenges of travel and the exposure to new people and new ways of doing things would profoundly change us. And though our psyches are wedded to decisions and choices made decades ago about the ‘right way’ to live in the world, the adventure is succeeding in making deep changes that would be more difficult to confront in our more familiar lifestyle and routines at home. I continue to feel more ease coming into my life as a traveler. Some of the ease comes from getting the hang of traveling: knowing a broader range of the forms that the unexpected can take, being able to better predict situations that are going to be stressful and respond by building more slack into the schedule, and learning how to pace our days and weeks so they have the right balance of biking and non-biking activities. But I know that some of the ease is also coming from shedding some of the artificial constraints that I have bound myself with for decades. It’s taken a surprising amount of time away from the old routines for those changes to really settle in. Years ago when these travels were in the early stages of a dream, we had imagined slowly working our way around the globe. Not with any particular agenda but it seemed like a good general plan. Europe was our intended training ground as its compactness and general bike-friendliness lends itself to cyclotouring in ways that the US doesn’t. But the harsh realities of 9/11 (11 September as many Europeans call it) clipped our wings and made venturing to many lands seem unsafe. And the war in Iraq hasn’t done anything to make us feel any better about many exotic lands. The unsettled world political situation combined with the many untraveled roads of Europe have made it easy for us to linger here longer than planned, though we do still long to travel farther east. We’ve just spent a week in northeastern Czech Republic and tomorrow we will venture back into Poland for a few days. Then it’s back to Czech Republic for a few additional days as we continue to zigzag our way west taking in the sights in the region. We’ll be in Germany in about 10 days and our first big sightseeing stop there will be Dresden. We’ve gone from sizzling to shivering as the weather turned markedly cooler for the last week in August. The temperature recently dropped down into the high 40’s one afternoon as the rain storm passed through our area. Most days aren’t that cold but the winds feel like they are coming off of snow when they pick up. Hopefully we’ll get another taste of warm weather before the cool and cold weather settles in for the season.